Vince, aged 22, is from Tacoma, Washington. He graduated high school in 2012, then graduated from the six month Refrigeration Technologies program in August 2013 at the age of 20. Thanks for your time Vince. What was your path to RSI? In high school I worked for a seafood company over in Tukwila, WA. I washed out transport containers, packaged crab and fish on pallets and then loaded them into units. After high school I continued to work there for a few months. I wasn’t sure what I wanted to do. I didn’t know whether I wanted to go to a university or a trade school; I was just flying in the wind. I did a little community college, trying to figure out where to go with my life. I decided I’d pursue a degree in international business, so I started a part-time associate’s degree program in business while I worked. Did you complete your associate’s degree? No, not yet, but I will. At that time I used to race motocross. About 2½ months after high school, in September 2012, I broke my back in two places, messed up my knee real good, and broke my leg. I was in the hospital for three months, and a wheel chair for two more before I started to walk and do physical therapy. It was a long road, but I decided to go to RSI when I finally felt capable in February 2013. I’m back to taking night classes now so I can complete my associate’s degree in the next year or two. So what made you decide to go to trade school not a university? While injured I had nothing better to do than think about my future. It was then that I decided on trade school, and refrigeration school in particular. Refrigeration has been in my family for generations from my great-grandpa, to my grandpa who used to own Tacoma & Seattle Trailer Repair, to my dad, and now me…and now my brother is going to RSI too. So that’s what started it I guess. The family has always been on the waterfront, working at the docks, so I guess I was born into it. I was motivated to go to RSI because the return on investment was so good. I paid off my school loan fairly quickly. RSI was a lot cheaper than a four year college degree, and I was done in six months. You can go to college, spend four years building up debt, and still not be sure about what you want to do when you get out. Then you’re screwed because you’ve wasted a lot of time and money. At a trade school where you get hands-on learning, it’s easier to learn what the career may be like when you’re done, because you’re kind of in the work environment already and they give you the tools to be successful. So what made you choose RSI? I was determined to be as successful as my grandpa and my dad have been in this field. I made a decision to stop wasting time, and start making money. Refrigeration is a great trade; it’s growing and it’s only going to increase. I did some research and my focus going in to RSI was low temp units and chillers. What was your favorite part of the program and why? I really enjoyed the fact that it was so hands-on because I’m a visual learner; I liked the low temp part and the troubleshooting. It was really fun, especially with great teachers like Mike in Phase 9 where you troubleshoot units, wire up different schematics and things like that. It actually made me develop a train of thought, rather than just knowing factual information about systems. The final phase is where everything clicks, comes together, and makes sense. How long after graduation did it take to find a job? It took me a couple of months, but that was down to me. I could have got a job right after graduation. I had offers before I even left RSI, but I had some things I wanted to do. Ericka in Career Services at RSI was awesome. She helped me with my résumé. I couldn’t get people to stop asking me if I wanted a job! I put work off because I wanted to get my welding certification when I got back to Tacoma. Since I was in school mode, I just kept going and continued my education with my parents support. I took welding classes from September to December before starting my job later in December. I’m a refrigeration technician at the Port of Tacoma. 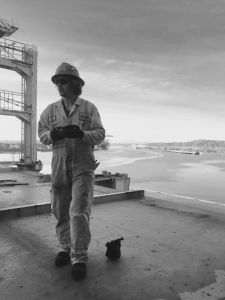 I work for Pacific Crane Maintenance Company at the Pierce County terminal. I’m in the import/export sea-going container business. I take care of all the refrigeration units that come and go overseas on ships and out on trucks. I pre-trip cans, getting them ready for their vessel trip. I steam clean them, repair any structural damage (which is where the welding comes in). I also monitor and plug & unplug the refrigeration units that are powered by 3-phase power. My job varies day-to-day depending on what’s going on at the dock. You have to be ready for anything. So were you happy with the starting salary? I was ecstatic with the money. I couldn’t believe I could get out of school and create that much money for myself by working. I was like, “Wow!” I always got my pay check in high school, and blew it on girls and having fun rather than actually saving, so now I’ve started to stack my cash away. One of the first things I did was pay off my school loan. I managed to do that pretty quickly. Later, I took my first vacation without my parents. I went to watch one of my best friends race motocross down in Georgia for 8 days. I also bought my Tahoe. After a couple of years of working, I’d saved enough cash for that bad boy! Did you leave RSI feeling that you were on your way to becoming a specialist? Yes, I did. The way we were taught, the strict organization of the program, the reasons behind why the program is structured the way it is, is all a big boost. Instructors like Mike and Phil, these guys have been through it all; to benefit from their experience and knowledge is so gratifying. You have to take it all in. It’s well planned and strategically organized to set you up to be one of the greatest techs out in the field. I feel so confident in myself and my ability. It’s a real confidence booster to have journeymen techs, our teachers, applaud you in class, and to learn all this stuff in such a short amount of time. Refrigeration is refrigeration, but understanding why you should approach things in a set way, what you should attack first for certain problems, they do a really good job of teaching you that. I wouldn’t expect another college to offer the amount of knowledge that RSI does in such a short amount of time. What is your favorite aspect of working this job? I like to think I’m keeping America rolling. I have a real sense of purpose. I love the fact that what I do is important. I’m part of the international import/export world, maintaining container units that carry commodities around the world for humans to use. I make sure my units are like new because you never want things to go to waste. Anybody can get a job a Starbucks, but it’s so much more satisfying when you have a skill, when you have a purpose, a reason to get up and go to work every day and do your best. Where do you hope your career will be in three years? I think I’ll still be down here on the docks, just maybe in a different terminal working with different customers. I’d like to think I could be a foreman in a few years. That’s the next step up. What’s your dream job in the refrigeration field? I have my dream job. I love low temp, commercial refrigeration, it’s the coolest thing ever. This is where the money is at; I feel like this is my destiny. For people who are wondering whether to go to RSI, I’d ask, “how bad do you want it?” There’s no better feeling than getting up on your feet, being able to take care of yourself, or taking care of loved ones. I cycle for fun, and fitness is a big part of my life now after my accident, especially after enduring all the pain it takes to mend bones. 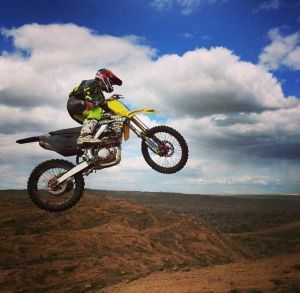 I still ride motocross for fun, just trail riding with my friends. I know I have to go back to work the next day. My job is my priority. It’s my livelihood, and I have to protect it. I like to go golfing. I’ve been doing that a lot recently. I’d take care of my grandpa, and my parents; give them some funds to make sure they’re good through retirement. I wouldn’t be where I am without the guidance of my parents, Bryan and Bonnijean Wiener and my grandparents, Neil and Judy Wiener. Everything I’ve done was ultimately my decision, but I couldn’t have done it without their love and support. They’ve always helped me reach the goals and dreams that I’ve pursued and I can’t thank them enough for everything they’ve all done for me. I also want to start a non-profit that scraps metal to raise cash to provide food for the homeless, so I’d do that then I’d pay off some of my friends’ school loans. After that I’d buy an Audi R8 – a sports car – and take a drive down the golden coast. You’ve got to enjoy something for yourself right! ?